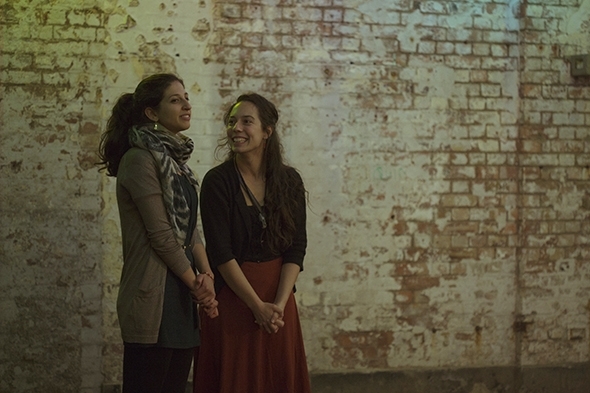 The Kaleidoscopic Arts Platform is ‘a new dance platform showcasing topical, physical and experimental dance works by emerging female choreographers.’ Its two producers are Konstantina Skalionta and Lucia Schweigert and this is their second event (a third is being planned for November). In a competitive cultural environment where initiatives seem to come to fruition or quietly die by virtue of their success or failure at the hands of Arts Council funding, it is heartening to find such entrepreneurs taking their dreams into their own hands and finding a way to make them work. There is no home theatre so the platform is conceived to take place in spaces not traditionally intended for dance. This one, part of Wandsworth Fringe 2015, is at Testbed1 @ The Doodle Bar in an old industrial building just behind the Royal College of Arts campus in Battersea. 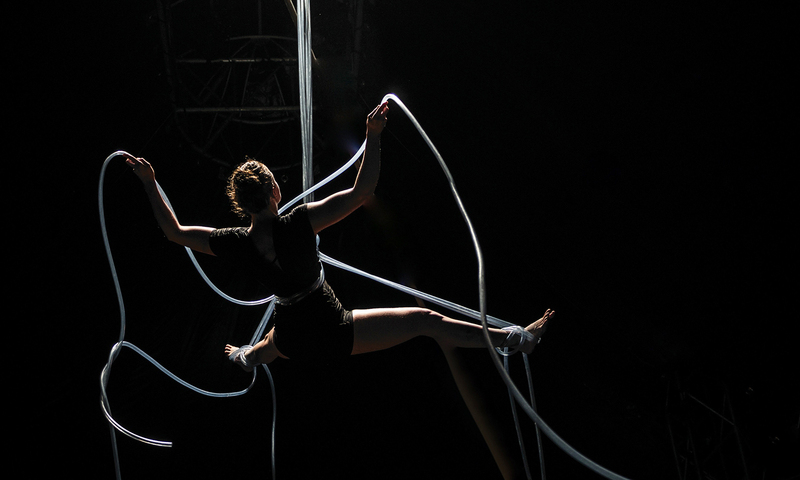 Three traps of black Marley on a concrete floor with vertically hung, coloured neon tubes mark the stage area but dancers are not confined to this. In other spaces of the building there are film projectors and fabric installations (by Bea Bonafini and Laura Elias) so the audience can mill around during the event. I was only able to attend the dress rehearsal so I missed the full promenade performance by Giulia Tacconi called Chance in which she dances around, amongst and with audience members. ‘When our body scans and researches movement, the most interesting and satisfying moments are the moments of surprise when the body creates new actions, gestures and feelings. 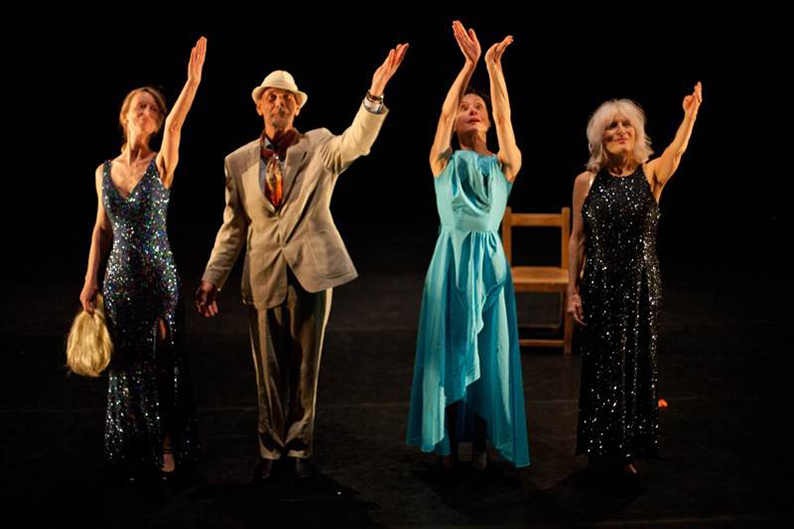 They are so-called ‘chances’… From what I understand in talking with Tacconi, the ‘surprise’ is in both the body of the dancer and of the audience member with whom she chooses to interact: improvised contact in which both dancer and audience emerge with new experiences. Sorry I missed it. The first work on the program is a solo, Trace, conceived and danced by Mara Vivas and inspired by photographer Jon Crispin’s Willard Asylum Suitcase Project in which he has photographed suitcases stored in the Asylum long after the deaths of their owners. Photography is all about memory, a sliver of experience that remains alive for as long as the photograph lasts. In Crispin’s project he is not only recording the present but opening up the past. Vivas translates the suitcase into a freestanding dress (conceived by Matthias Strahm) in which she is both the contents and their stored memories. It is an idea that translates beautifully into dance and Vivas has the clarity of language to bring it to haunting reality. Her strong features remind me of photographs of Frida Kahlo and the intriguing black dress she wears has a bodice with vertical grillwork reminiscent of a cell door. Vivas traces memory, fixing her eyes on the past and using her arms as feelers around her, at one moment obsessively picking out details of her dress and at another searching space for a familiar compass sighting. She is both constrained by her dress and then excitedly dances it to a Hugo Diaz tango. There is a weight in her presence and a lightness in her sensibility as she sails out over the water, finally stepping out of her dress on to dry land and releasing the memories; she has gone but the dress and its traces remain. 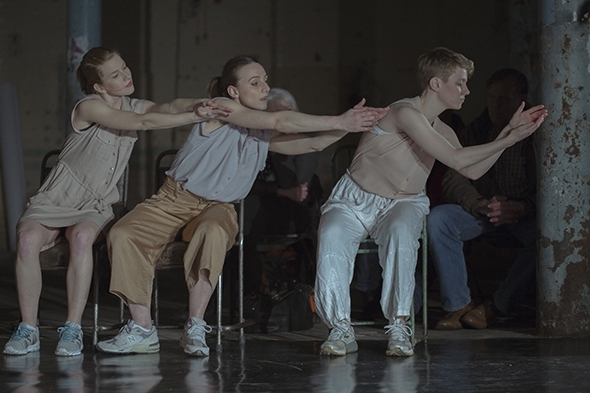 Rosa Manzi Reid’s Contemplating Distraction ‘explores the close relationship between focus and distraction in improvisation.’ The three performers — Reid, Vasanthi Argouin and Francesca Sgolmin — form Rian Dance. Coincidentally, ‘rian’ is an Irish word that means ‘trace’ or a path made by the passage of movement. The three women enter one by one and sit quietly on chairs as if in a waiting room. The movement is minimal, starting with half a smile and a surreptitious gaze and accumulating with successively larger movements of hand and body set to a musical hum arranged by Jonjo Keefe. Contemplating Distraction has a clear grammar with points of emphasis and stasis that keep it moving along its path in a playful way until it wanders off beyond the iron columns and the lights. All that is missing is the alchemy of presence that invests each gesture with a meaning beyond its physical expression. In Acts of Attending Julie Havelund and Agnese Lanza draw inspiration from their audience through observation. As there were only two photographers and a ahandful of artists watching, their rehearsal may not be representative of their performance but they demonstrated the idea. ‘We take information from what we see, what we hear and what is around us and elaborate them through movement.’ Lanza holds a voice recorder as the two stand together on stage observing and recording the detailed movement and attributes of (in this case) the cameraman. They had previously recorded their observations of the space in which they will be performing and it is these two recordings that form the aural structure of their ‘elaboration.’ It is part of their Interpares Project which ‘allows a sense of “inter-pares” between ourselves and the shared space to emerge from the work.’ Spatial observation is one thing, spatial awareness another; it is these two elements that play with each other and sometimes in contradistinction during the performance. The use of Handel’s Lascia Ch’io Pianga suspends the space on another dimension but the choreography here remains grounded. Then we are back to the physical attributes of the cameraman that Lanza and Havelund enact from their recording before switching off the recorder and turning out the lights. Perhaps it is the quantitative rather than qualitative approach to their observation that restricts their response; something is holding them back, but it may again be the lack of a sufficient pool of human material. Another coincidence of the platform is that one of the two films on show is about observation and movement. 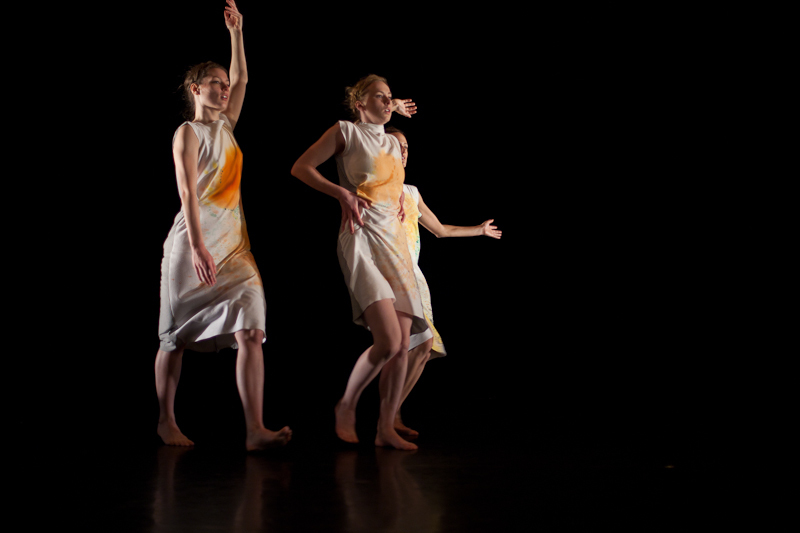 The Body Canvas, co-directed by Julie Schmidt Andreasen (who danced in Mara Vivas’ Triptych at Resolution! 2015) and Paul Vernon, makes a compelling visual link between the graphic artist’s eye and the dancer’s body: both are performing and the film is in turn a performance of their interaction, a depiction of the body drawn in space. 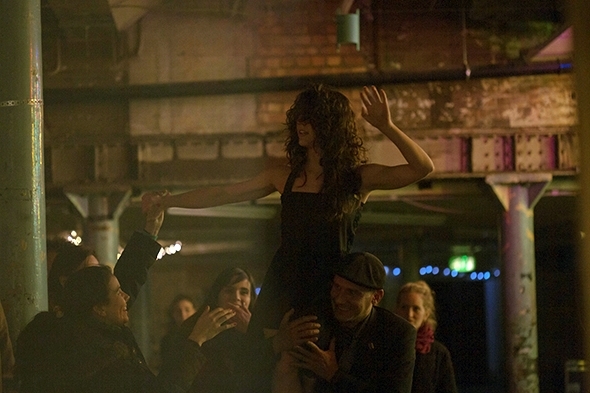 The other film is Urban Constellations by Fenia Kotsopoulou in which dance and urban space are juxtaposed: wildness of movement against a concrete landscape, improvisation against choreographed architecture. The screen is divided by a line that descends slowly over the course of the four-minute film like an image being scanned; above is black and white that slowly displaces the colour. The Kaleidoscopic Arts Platform moves in the other direction, displacing the black and white of cultural expectations with the colour of creative realization. Bravo.